So, what does great summer reading look like for me? Books like Mermaids in Paradise and Skios: silly, farcical romps that are breezy and laugh-out-loud funny. Sweet and charming best-sellers like A Man Called Ove. Quirky, cute, creative, and highly readable books like Where’d You Go, Bernadette. And, of course, fun, page-turner YA books that are post-apocalyptic (like The Hunger Games) or magical (like Harry Potter) or supernatural (like Beautiful Creatures). The Raven Boys falls squarely in the last category. A girl named Blue lives with her mom and a bunch of other women (aunts, friends, etc. ), all of whom are psychics. Blue lacks psychic powers, but she has a different weird ability: her presence makes others’ psychic powers stronger. On April 24, St. Mark’s Eve, Blue accompanies her aunt to a nearby church. That night every year, psychics can see the soon-to-be-dead. Everyone in town who will be dead within the next year appears at the church. Blue has been to the church for the past ten years on St. Mark’s Eve to help others see the dead more clearly, but she’s never seen anyone herself. Until this year. For the first time, she is able to see someone: a kid her age. His name is Gansey (“just Gansey”), and he’s a “Raven Boy”–Blue can tell by his distinctive Aglionby Academy uniform. Not long after St. Mark’s Eve, of course, Blue meets the real (still alive) Gansey, and their lives become immediately and oddly intertwined. I was certain I would enjoy this book. It seemed like perfect YA summer fluff: quick, light reading that’s a little dark (death, murder) and a little supernatural (spirits and psychics and such). It had a similar feel to Beautiful Creatures–weird family with supernatural powers in a Southern town. Not to mention, it’s set in Virginia (my home state). All the better! And, to top it off, this book has average ratings over four stars on both Goodreads and Amazon. And the absolute worst: “have drank” was used. My skin crawls. Reading a book riddled with errors is tough. For me, it breaks my reading flow drastically. I read and re-read the erroneous sentences multiple times, trying to make sense of them. It’s annoying. And unacceptable. A book this sloppy is not worth reading. Another beef that makes me feel like a broken record: YA series books that do not stand alone. This book (which is, not surprisingly, part of a trilogy) has no resolution, many bizarre open ends, and odd little twists thrown in at the very end to entice you to read the next book in the trilogy. I learned my lesson reading Divergent: if the first book is bad, chances are the next books aren’t going to be any better. I’m done with this trilogy. Sorry, Raven Boys. Who should read it: Skip this one. But don’t write Maggie Stiefvater off altogether. I actually enjoyed (and breezed through) her Shiver Trilogy. It’s cheesy YA fluff (werewolves! ), but sometimes that’s delightful. And I’ve heard great things about The Scorpio Races, so that will remain on my reading list. This entry was posted in Rating: 2/5 and tagged Book review, Book Reviews, Books, Maggie Stiefvater, Shiver, summer reading, The Raven Boys, YA. Bookmark the permalink. Sadly your review is pretty spot on. I am 2/3 done with this book and the editing/typos were irritating me too! 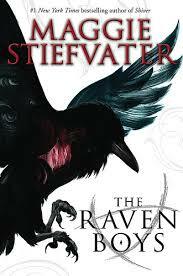 I really wanted to like it as I loved the Shiver Trilogy. Worse, I think there will actually be four books in this series…yikes! I do sometimes like the way MS phrases things, and laughed out loud at Gansey quoting Dorothy Parker (“What fresh hell is this?”) so it’s not a total loss. Thanks for your honesty. It’s refreshing! Ugh, really? You know what’s worse than three terrible books? FOUR terrible books! I’m keeping my fingers crossed for The Scorpio Races. I’ll let you know . . .